Analysis of observations indicates that there was a rapid increase in summer (June–August) mean surface air temperature (SAT) since the mid-1990s over Western Europe. Accompanying this rapid warming are significant increases in summer mean daily maximum temperature, daily minimum temperature, annual hottest day temperature and warmest night temperature, and an increase in frequency of summer days and tropical nights, while the change in the diurnal temperature range (DTR) is small. This study focuses on understanding causes of the rapid summer warming and associated temperature extreme changes. 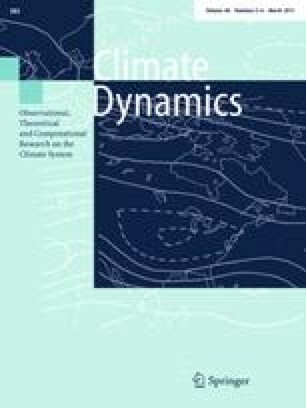 A set of experiments using the atmospheric component of the state-of-the-art HadGEM3 global climate model have been carried out to quantify relative roles of changes in sea surface temperature (SST)/sea ice extent (SIE), anthropogenic greenhouse gases (GHGs), and anthropogenic aerosols (AAer). Results indicate that the model forced by changes in all forcings reproduces many of the observed changes since the mid-1990s over Western Europe. Changes in SST/SIE explain 62.2 ± 13.0 % of the area averaged seasonal mean warming signal over Western Europe, with the remaining 37.8 ± 13.6 % of the warming explained by the direct impact of changes in GHGs and AAer. Results further indicate that the direct impact of the reduction of AAer precursor emissions over Europe, mainly through aerosol-radiation interaction with additional contributions from aerosol-cloud interaction and coupled atmosphere-land surface feedbacks, is a key factor for increases in annual hottest day temperature and in frequency of summer days. It explains 45.5 ± 17.6 % and 40.9 ± 18.4 % of area averaged signals for these temperature extremes. The direct impact of the reduction of AAer precursor emissions over Europe acts to increase DTR locally, but the change in DTR is countered by the direct impact of GHGs forcing. In the next few decades, greenhouse gas concentrations will continue to rise and AAer precursor emissions over Europe and North America will continue to decline. Our results suggest that the changes in summer seasonal mean SAT and temperature extremes over Western Europe since the mid-1990s are most likely to be sustained or amplified in the near term, unless other factors intervene. An erratum to this article is available at http://dx.doi.org/10.1007/s00382-017-3590-4. European summer climate exhibits variability on a wide range of timescales. Understanding the nature and drivers of this variability is an essential step in developing robust climate predictions and risk assessments. In the last few decades, Europe has warmed not only faster than the global average, but also faster than expected from anthropogenic greenhouse gas increases (Ruckstuhl et al. 2008; Philipona et al. 2009; van Oldenborgh et al. 2009). With the warming, Europe experienced record-breaking heat waves and extreme temperatures that imposed disastrous impacts on individuals, and society (Stott et al. 2004; Fischer and Schär 2010; Barriopedro et al. 2011; Christidis et al. 2011, 2012; Hegerl et al. 2011; Rahmstorf and Coumou 2011; Hoerling et al. 2012; Schubert et al. 2014; Sillmann et al. 2014; Vautard et al. 2007, 2013). Such climate events are often accompanied by prominent anomalies in atmospheric circulation and precipitation, as well as in the conditions of the nearby land and ocean surfaces. The extreme 2003 European and 2010 Russian heat waves have been shown to be associated with blocking regimes. However, Barnes et al. (2014) showed that there is no increasing trend of summer blocking frequency over Western Europe based on three different reanalysis data sets, suggesting that the link between rapid surface warming and changes in blocking frequency on the decadal time scale is weak. The impacts of temperature extremes have highlighted the urgency of improved understanding of their physical causes and to what extent they are a manifestation of a warming world (e.g., Dole et al. 2011; Trenberth and Fasullo 2012; Otto et al. 2012; Christidis et al. 2014; Perkins 2015). A number of studies have investigated the factors contributing to such extreme events (Schär et al. 2004; Otto et al. 2012; Hanlon et al. 2013; Christidis et al. 2014) and how extremes will change in response to anthropogenic forcings (Kim et al. 2013; Lindvall and Svensson 2014; Cattiaux et al. 2015; Vavrus et al. 2015). These factors include the role of soil–atmosphere feedbacks during the hot summers. In summer, dry soil induces fewer clouds, presumably through reduced upward latent heat fluxes, which in turn increases the amount of incident solar energy at the surface and further enhances heat fluxes and the ratio of sensible over latent heat fluxes. This causes a positive feedback to soil drying (Vautard et al. 2007; Fischer and Schär 2010; Seneviratne et al. 2010; Fischer et al. 2012; Kim et al. 2013; Boé and Terray 2014; Lindvall and Svensson 2014; Miralles et al. 2014; Cattiaux et al. 2015; Whan et al. 2015), highlighting the importance of local land–atmosphere interactions in driving the regional temperature extremes. Other factors include SST anomalies affecting heat waves in Western Europe through boundary forcing induced large scale circulation (e.g., Cassou et al. 2005; Sutton and Hodson 2005; Black and Sutton 2007; Della-Marta et al. 2007; Carril et al. 2008; Feudale and Shukla 2011a, b; Kamae et al. 2014). Due to air quality legislation, AAer precursor emissions in Europe and North America have continuously decreased since the 1980s (Smith et al. 2011; Kühn et al. 2014). This decrease in AAer precursor emissions and the accompanied increase in downward surface solar radiation (solar “brightening”) is considered as the likely cause of the rapid warming over Western Europe (Wild 2009, 2012; Folini and Wild 2011; Nabat et al. 2014). However, it is still not clear to what extent the rapid warming over Western Europe is a result of a fast land–atmosphere response to the direct impact of changes in GHGs and AAer and to what extent the warming is mediated by the SST changes induced by these forcings. In particular, the relative roles of these forcing factors on the temperature extremes have not been investigated. The main aims of this work are to determine the relative roles of changes in: (i) SST/SIE, (ii) GHGs, and (iii) AAer forcings in shaping the changes in the summer mean SAT and temperature extremes since the mid-1990s over Western Europe. This will be achieved by performing a set of experiments using the atmospheric component of the state-of-the-art HadGEM3 global climate model. In this paper, we do not address the role of land use change (e.g., Christidis et al. 2013). The structure of the paper is as follows. Section 2 describes observed changes since the mid-1990s. In Sect. 3, the model and experiments are described briefly. Section 4 presents simulated changes in response to different forcings. Section 5 elucidates the physical processes for the responses. Conclusions are in Sect. 6. The monthly mean SAT data sets used are the University of Delaware (UD) land SAT (1901–2010) (Legates and Willmott 1990a, b), the CRU TS3.21 data sets (1901–2013) on a 0.5° × 0.5° grid (Harris et al. 2014), the NASA GISS Surface Temperature Analysis (GISTEMP) (1880–2013) on a 2° × 2° grid (Hansen et al. 2010), and the HadCRUT4 data set (Morice et al. 2012). Temperature extreme indices used are daily maximum temperature (Tmax), daily minimum temperature (Tmin), and annual hottest day temperature (TXx), warmest night temperature (TNx), the diurnal temperature range (DTR), the frequency of summer days (SU, annual number of days when Tmax > 25 °C), and tropical nights (TR, annual number of days when Tmin > 20 °C). Tmax, Tmin, and DTR are based on CRU TS3.21 data sets. TXx, TNx, SU, and TR are based on HadEX2 data set (Donat et al. 2013) and the E-OBS gridded data set (Haylock et al. 2008). Monthly mean SSTs used are HadISST on a 1° × 1° grid (Rayner et al. 2003). Monthly mean variables of NCEP/NCAR reanalysis (1979–2013) (Kalnay et al. 1996) and monthly sea level pressures of HadSLP2 date (Allan and Ansell 2006) are also used. Illustrated in Fig. 1 are time series of the area averaged summer (June to August, JJA) SAT, and summer or annual temperature extreme anomalies over Western Europe (35°N–70°N, 10°W–40°E, land only) relative to the climatology over the time series expanding period. One of most important features is the abrupt surface warming since the mid-1990s (Fig. 1a). The change in SAT during the recent 16 years (1996–2011) relative to the early period 1964–1993 ranges from 0.93 to 1.10 °C from four data sets, consistent with previous studies (Ruckstuhl et al. 2008; Philipona et al. 2009; van Oldenborgh et al. 2009). The rapid summer mean warming over Western Europe was also accompanied by changes in temperature extremes. The time evolutions of area averaged temperature extremes (Fig. 1b–d) show a rapid increase in summer mean Tmax, Tmin, TXx and TNx over Western Europe. The change in DTR, however, is small. Analysis also shows a rapid increase in the frequency of SU, and TR over Western Europe since the mid-1990s. SU and TR have increased by 8 and 3 days respectively over the last 16 years relative to 30 year mean (1964–1993). The spatial patterns of changes in SAT and temperature extremes between the two periods are illustrated in Fig. 2. Most important changes are the increase in summer mean SAT, Tmax and Tmin over most regions with a magnitude of about 0.8–1.2 °C over Europe although there are some spatial variations (Fig. 2a–c). The changes in SAT, Tmax, and Tmin show a large increase over Central and Southern Europe while the changes in DTR are relatively small despite a weak increase over Central Europe of about 0.2–0.6 °C (Fig. 2d). The changes in TXx and TNx (Fig. 2e, f) between the two periods show a localized maximum (about 1.8 and 1.2 °C respectively) over Central Europe and indicate that the increase in TXx is larger than the increase in TNx. The changes in frequency of SU and TR (Fig. 2g, h) also show an increase with a local maximum around the Mediterranean region of about 12–16 and 2–8 days respectively, suggesting larger increase in the number of hot days than warm nights. What has caused these rapid changes in both summer mean SAT and temperature extremes over Western Europe since the mid-1990s? By performing a set of numerical experiments using the atmospheric component of the state-of-the-art HadGEM3 global climate model with different forcings we will investigate the drivers for those observed changes since the mid-1990s. Relative to the baseline period of 1964–1993, there are changes in potential drivers of climate from the mid-1990s (Fig. 3). SSTs have warmed (Fig. 3a). There are significant increases in anthropogenic GHG concentrations (11 % increase in CO2, 18 % increase in CH4, and 6 % increase in N2O) and significant changes in AAer precursor emissions (Lamarque et al. 2010) with European and North American sulphur dioxide emissions decreased while Asian emissions increased (Fig. 3b). Climate model experiments have been carried out to identify the roles of changes in SST/SIE, GHG and AAer forcings in the recent changes in summer mean temperature and temperature extremes over Western Europe. The model used is the atmosphere configuration of the Met Office Hadley Centre Global Environment Model version 3 (HadGEM3-A) (Hewitt et al. 2011), with a resolution of 1.875° longitude by 1.25° latitude and 85 levels in the vertical. The model includes an interactive tropospheric chemistry scheme and eight aerosol species (ammonium sulphate, mineral dust, fossil-fuel black carbon, fossil-fuel organic carbon, biomass-burning, ammonium nitrate, sea-salt, and secondary organic aerosols from biogenic emissions). Both aerosol-radiation and aerosol-cloud interactions are considered (Bellouin et al. 2013 ). Data sets required by the tropospheric aerosol scheme in the model are emissions of sulphur dioxide (SO2), land‐based dimethyl sulphide (DMS), ammonia (NH3), and primary black and organic carbon aerosols from fossil fuel combustion and biomass burning. A set of experiments (each for either 32 or 27 years) has been carried out to identify the roles of changes in: (i) SST/SIE, (ii) anthropogenic GHGs, and (iii) AAer forcings in shaping the changes of the summer mean SAT and temperature extremes over Western Europe. The experiments are: CONTROL forced by the early period (1964–1993) SST/SIE, GHGs and AAer; ALL forced by the recent period (1996–2011) SST/SIE, GHGs and AAer; SSTGHG forced by the recent period SST/SIE and GHGs, but the early period AAer; SSTONLY forced by the recent period SST/SIE, but the early period GHGs and AAer. No attempt has yet been made to separate the anthropogenic contribution to SST/SIE change in these experiments. Detailed experiments are documented in Table 1 and they are the same experiments as those investigated in Dong and Sutton (2015) for the recent recovery of the Sahel rainfall. The last 25 years of each experiment are analysed and the response to a particular forcing is estimated by the difference between a pair of experiments that include and exclude that forcing. Statistical significance of the summer mean or annual changes and the 90 % confidence intervals of the area averaged changes over Western Europe in both observations and model experiments are assessed using a two tailed Student t test. In this section, climatological features of the CONTROL experiment are compared with observed features (Fig. 4). Figure 4a–c show the SAT based on NCEP reanalysis (Kalnay et al. 1996), sea level pressure (SLP) of HadSLP2 (Allan and Ansell 2006). 850 hPa wind distribution (NCEP reanalysis), and observed rainfall based on GPCP (Adler et al. 2003). Figure 4d–f show the corresponding model climatologies. Observations show a strong meridional SAT gradients around 45°N over East North Atlantic and Western Europe (Fig. 4a–c). The circulation is characterized by the subtropical anticyclone over subtropical North Atlantic and with a ridge extending eastward over the Mediterranean region (Fig. 4b). Associated with circulation are strong westerlies across the UK into Western Europe and northwesterlies over the east part of the Mediterranean region. Observed precipitation indicates a band of large precipitation of >2.0 mm day−1 extending from North Atlantic into Western Europe with precipitation over the Iberian Peninsula and over the Mediterranean Sea being <1.0 mm day−1. The model reproduces the spatial patterns of the summer climate fairly well over the North Atlantic and the European sector (Fig. 4d–f), suggesting that it is an appropriate tool for the investigation of the response of regional climate to different forcings. The spatial patterns of changes in summer mean SAT in response to different forcings are shown in Fig. 5. The model experiment forced by changes in SST/SIE and anthropogenic GHG and AAer forcings (Fig. 5a), relative to the CONTROL, reproduces many of the observed changes over Europe (Fig. 2a). Responses to the different forcings indicate that the warming is predominately due to changes in SST/SIE (Fig. 5b) with the direct impact in AAer changes playing an important role for warming over Central and Southern Europe. The direct impact in GHG changes induce more localized warming over Northwestern Europe (Fig. 5c). Changes in SAT in response to different forcings show large spatial variations across Europe, implying the role of changes in regional circulation and land surface feedbacks for the simulated response in summer mean SAT. The detailed mechanisms of responses to different forcings will be discussed in Sect. 5. The responses of summer seasonal mean daily Tmax, Tmin, and DTR to different forcings are illustrated in Fig. 6. In response to changes in all forcings, the model results show an increase in both Tmax and Tmin over Europe with changes in Tmax being large over Southern and Central Europe, while Tmin changes show a more uniform increase (Fig. 6a, b). As a result, DTR changes show an increase over Southern and Central Europe (Fig. 6c). Comparison with observed changes (Fig. 2d) indicate that the enhancement of DTR over Southern and Central Europe is overestimated in the model simulations. Changes in SST/SIE lead to an increase in both Tmax and Tmin over a large part of Europe with a similar magnitude except for around the Mediterranean coast where Tmax changes are larger than Tmin changes. As a result, DTR change is small except for a weak increase around the Mediterranean coast (Fig. 6f). The direct impact of GHG changes leads to an increase in both Tmax and Tmin with large increase over Northern Europe of similar magnitude (Fig. 6g, h). As a result, the direct impact of GHG changes induced DTR change is weak over most regions of Western Europe, except for a decrease over Southwestern Europe (Fig. 6i) where Tmax shows a decrease related to an increase in cloud cover (Sect. 5.2). In contrast, the direct impact of AAer changes through aerosol-radiation and aerosol-cloud interactions leads to an increase in Tmax over a latitude band of 40°–50°N over Europe while AAer induced changes in Tmin are smaller (Fig. 6j, k). As a result, AAer changes induce significant increases in DTR over Europe (Fig. 6l). Comparing responses of DTR to different forcings indicates that the increase of DTR in all forcing experiment over Western Europe is predominately due to the direct impact from AAer changes (Fig. 6c, f, i, j). The spatial patterns of responses in TXx and TNx are illustrated in Fig. 7 and changes in frequencies of summer days and tropical nights are in Fig. 8. Figure 7 demonstrates the important role of changes in AAer for changes in TXx over Western Europe while the changes in SST/SIE plays the dominant role for change in TNx. Figure 8 shows an equally important role of changes in SST/SIE and AAer for the increase in frequency of summer days, while the increase in frequency of tropical nights is predominantly due to the change in SST/SIE. Some area averaged summer or annual temperature extreme indices over Western Europe for both observations and model simulations are illustrated in Fig. 9. There is good agreement between the model forced by changes in all forcings and observed changes in summer seasonal mean SAT, Tmax, and Tmin (Fig. 9a). In response to changes in all forcings, the model simulates an area-averaged summer mean SAT change of 1.16 ± 0.21 °C over Western Europe, which is very close to observed change of 0.93 to 1.10 °C although differs in spatial pattern. The changes in SST/SIE explain 62.2 ± 13.0 % of the area-averaged SAT signal, with the 37.8 ± 13.6 % explained by the direct impact of changes in GHGs and AAer (Fig. 9b). Both changes in SST/SIE and AAer lead to an increase in Tmax, while the increase in Tmin is predominantly due to the change in SST/SIE (Fig. 9b). The direct impact of AAer changes act to increase DTR, but change in DTR is countered by direct impact of GHG forcing. However, DTR change in response to all forcings is overestimated by the model. Results further suggest that the direct impact of AAer changes plays an important role in the increase in TXx and the increase in frequency of summer days (explaining 45.5 ± 17.6 % and 40.9 ± 18.4 % of the signal in the response to changes in all forcings). The increases in TNx and in the frequency of tropical nights are mainly mediated through the warming of the ocean (Fig. 9b). In this section, the physical processes responsible for the model responses to different forcings are elucidated in detail by focusing on changes in the surface energy components and related variables over land. The spatial patterns of summer mean changes for the components of surface energy balance and related variables induced by changes in SST/SIE forcing are illustrated in Fig. 10. In response to changes SST/SIE, the specific humidity over land increases (Fig. 10a). Under the hypothesis that atmospheric moisture over European land comes to a large extent from oceanic evaporation through atmospheric transport, continental specific humidity is expected to increase more in line with temperature change over oceans (e.g., Boé and Terray 2014). As the warming is generally larger over land in the response to the changes in SST/SIE (Figs. 3a, 5b), specific humidity over land will increase less than specific humidity at saturation which increases with the continental surface temperature following the Clausius-Clapeyron relationship. This leads to a decrease in relative humidity (Fig. 10c) (e.g., Rowell and Jones 2006; Dong et al. 2009). With decreasing relative humidity, saturation becomes harder to reach, the lifted condensation level increases, which then leads to a decrease in continental cloud cover (Fig. 10d) (e.g., Dong et al. 2009; Fasullo 2010; Boé and Terray 2014). The decrease of cloud cover leads to positive shortwave cloud radiative effect (SW CRE) and negative longwave (LW) CRE (Fig. 10e, f), and therefore an increase in net surface SW (Fig. 10g). The increase of the surface net SW radiation and clear sky LW radiation over land, only part of which is compensated by net surface longwave cooling (Fig. 10h) related to the negative LW CRE and increased upward turbulent heat flux (Fig. 10i), acts to warm the surface. Note, however, that the small net LW anomaly (Fig. 10h) is likely to reflect a balance between increased absorption of radiation emitted by the warmer and moister atmosphere, increased emission from the warmer surface (Fig. 10b), and LW CRE (Fig. 10f). The role of reduced cloud cover on warming over Eastern Europe is in line with the study of Tang et al. (2012) who highlighted the role of decreases in cloud for European hot summers in observations. Our study further suggests that the decrease in summer cloud cover over Europe during the recent decades might be partially due to changes in SST/SIE. The decrease in cloud cover is in turn also partly responsible for increases in Tmax, TXx, and the frequency in summer days (Fig. 9b). The spatial patterns of summer mean changes for the components of surface energy balance and related variables induced by changes in GHG forcing are illustrated in Fig. 11. The primary surface energy change over Europe is an increase in the net surface LW radiation (Fig. 11a), partly due to the increase in downward surface LW radiation (as expected for an enhanced Greenhouse Effect) and partly due to LW feedback related to the increase in water vapour (Fig. 11b). The cloud cover changes show a dipole structure with a decrease over Northern Europe and an increase over Southern Europe (Fig. 11c), consistent with the dipole pattern of changes in relative humidity (Fig. 11d), precipitation and soil moisture (Fig. 11e, f). The complex patterns of changes in relative humidity, cloud cover, precipitation and soil moisture reflect the impact of GHG induced changes in circulation over the North Atlantic and European sector that is characterized by anomalous high SLP over high latitude and anomalous low SLP to south over Southern Europe (not shown). The dipole pattern in change of the cloud cover leads to a dipole pattern of changes in SW CRE with positive anomalies over Northern Europe and negative anomalies over Southern Europe (Fig. 11g). LW CRE shows the opposite changes, but with smaller magnitude (Fig. 11h). This leads to dipole pattern of changes in net surface SW (Fig. 11i), leading to relatively large seasonal mean warming and increase in Tmax and TXx over Northern Europe (Figs. 5c, 6g, 7e). The spatial patterns of summer mean changes for the components of surface energy balance and related variables induced by changes in AAer are illustrated in Fig. 12. Changes in sulphate aerosol optical depth (AOD) (Fig. 12a) show a decrease of ~0.2–0.4 over Western Europe which is about 40–80 % decrease relative to the simulation for the period 1964–1993. The magnitude of the decrease in model simulated sulphate AOD is similar to observed changes from six locations over Europe (Ruckstuhl et al. 2008). The decrease in AAer precursor emissions over Europe induces a significant local warming through aerosol-radiation and aerosol-cloud interactions (e.g., Twomey 1977; Rosenfeld et al. 2008; Nabat et al. 2014; Dong et al. 2015). Changes in surface energy budget are characterized by large increase in the net SW over Europe (Fig. 12b). Cloud cover changes show a large decrease over Central and Southern Europe (Fig. 12f) with an increase to the north, consistent with the changes in soil moisture over Europe (Fig. 12i). The decrease in cloud cover gives rise to positive SW CRE of 2–6 W m−2 and negative LW CRE of 2–4 W m−2 (Fig. 12h, i). These lead to larger changes in the net SW of about 8–16 W m−2 and LW of about 4–8 W m−2 (Fig. 12b, c) than change in the clear sky net SW of about 6-8 and LW at the surface (not shown). The increase in clear sky SW at the surface is about 2–3 times as large as the increase in SW CRE (Fig. 12b, g), indicating the dominant role of aerosol-radiation interaction in the surface solar radiation change over Western Europe. This is in line with Ruckstuhl et al. (2010) who found a small contribution of cloud impact to the recent solar brightening over Europe. The increase in surface net SW and the decrease in upward latent heat flux (Fig. 12d) due to soil drying (Fig. 12i) over Southern Europe give rise to large warming in surface air temperature over Western Europe and large changes in temperature extremes. These results further suggest that decreased AAer precursor emissions over Europe might also play an important role for the decrease in summer cloud cover during the recent decades over Europe (e.g., Tang et al. 2012) in which the deficit of soil moisture limits evapotranspiration, which results in an increased upward sensible heat fluxes (Fig. 12e) due to the energy conservation constraint. The shift towards higher sensible heat fluxes in turn produces drier and warmer air and increases evaporative demand, which dries the soil further (Mueller and Seneviratne 2012; Boé and Terray 2014; Miralles et al. 2014; Cattiaux et al. 2015; Whan et al. 2015). This positive feedback loop generates less cloud and increased surface SW radiation, which again causes even more drying, illustrating the importance of soil processes in driving the regional responses of temperature and temperature extremes (Dai et al. 1999; Jaeger and Seneviratne 2011; Mueller and Seneviratne 2012; Stegehuis et al. 2012; Whan et al. 2015) and resulting in increases in Tmax, TXx, and the frequency in summer days as well as an enhancement of DTR (Fig. 9b). Various studies have demonstrated the role of precipitation deficit in spring for hot temperature extremes in summer (Mueller and Seneviratne 2012; Whan et al. 2015). We have analysed precipitation and soil moisture changes in spring season (MAM) in response to AAer changes and results indicate that there are no significant pre-summer soil moisture anomalies that persist into summer (not shown). These suggest that summer drying (Fig. 12i) over Central Europe is mainly the outcome of reduced precipitation in summer, rather than any pre-summer signals, and that the impact of pre-summer land surface conditions on summer surface temperature and temperature extremes in our model simulation is weak. Therefore, three factors in response to AAer changes in the recent decade cause elevated summer SAT and change in temperature extremes: (1) increased solar radiation reaching the surface because of aerosols-radiation interaction due to the reduction of AAer precursor emissions, (2) further enhanced surface solar radiation by the reduction in cloud cover through aerosol-cloud interaction (e.g., Twomey 1977; Rosenfeld et al. 2008), and land–atmosphere interaction (e.g., Zampieri et al. 2009; Jaeger and Seneviratne 2011; Mueller and Seneviratne 2012; Stegehuis et al. 2012; Cattiaux et al. 2015; Whan et al. 2015), and (3) less energy going toward changing the phase of soil water from liquid to vapor due to soil drying and more energy going toward increasing the air temperature through increased upward sensible heat flux (Boé and Terray 2014; Miralles et al. 2014; Cattiaux et al. 2015; Whan et al. 2015). However, the magnitude of this positive SW CRE (Fig. 12g) on surface SW radiation change in our model experiments is about 1/3 of the clear sky SW radiation change (Fig. 12b minus 12g), highlighting the dominant role of aerosol-radiation interactions for the summer mean warming and changes in temperature extremes over Western Europe. Similar conclusions were reached based on observations for the role of aerosols on recent solar brightening over Europe (e.g., Ruckstuhl et al. 2008, 2010). In this study, we have investigated the rapid summer mean warming over Western Europe and associated temperature extreme changes since the mid-1990s. Firstly, we have analyzed observations. Then we have performed a set of experiments using the atmospheric component of the state-of-the-art global climate model HadGEM3 to quantify the roles of changes in: (i) SST/SIE, (ii) GHG, and (iii) AAer forcings in shaping the changes in the summer mean SAT and temperature extremes. No attempt has yet been made to separate the anthropogenic contribution to SST/SIE change. The main findings are summarized below and the major processes of the responses in temperature and temperature extremes over Western Europe to different forcings are summarized schematically in Fig. 13. The response to the increase in GHGs is mainly related to direct impact on clear sky downward longwave radiation and associated cloud and surface feedbacks. In response to changes in SST/SIE, it is the increased water vapour over Western Europe that leads to surface warming with positive surface and cloud feedbacks resulted from surface drying and the reduction in cloud cover. The response to AAer changes is mainly through aerosol-radiation interaction with additional contributions from aerosol-cloud interaction and coupled atmosphere-land surface feedbacks. The analysis of observations indicates that there was a rapid increase in summer mean surface air temperature since the mid-1990s over Western Europe. The area averaged summer mean SAT change over the region during the period 1996–2011 increased by 0.93 to 1.10 °C relative to the period 1964–1993 for the four surface temperature data sets. Accompanied by this rapid summer mean surface warming are rapid changes in temperature extremes. The changes in temperature extremes are characterized by a rapid increase in summer mean Tmax, Tmin, TXx (1.2 °C) and TNx (1.0 °C). The change in DTR is small. Observations also show a rapid increase in frequency of summer days and tropical nights by 8 and 3 days respectively. The HadGEM3A model response to changes in SST/SIE, anthropogenic GHG, and AAer forcings reproduce many of observed changes in summer mean SAT and temperature extremes over Western Europe. The area averaged changes in SAT (1.16 °C) and temperature extremes are quantitatively similar to observed changes except that the model overestimates the increase in DTR (Fig. 9a). Responses to different forcing factors indicate a significant role for the direct impact (in addition to an impact via SST/SIE changes) of changes in anthropogenic forcings, especially aerosols, in the rapid warming of European summer temperatures. The drying of the land surface and reduction of cloud cover exert important positive feedbacks. Changes in SST/SIE explain 62.2 ± 13.0 % of the area averaged seasonal mean warming signal over Western Europe, with the remaining 37.8 ± 13.6 % signal explained by the direct impact of changes in anthropogenic GHGs and AAer. The direct impact of changes in AAer is a key factor for the increases in TXx and frequency of summer days. It explains 45.5 ± 17.6 % and 40.9 ± 18.4 % of area averaged signals for these temperature extremes. The direct impact of AAer changes act to increase DTR, but change in DTR is countered by direct impact of GHG forcing. Whilst each forcing factor causes summer mean surface warming and associated temperature extreme changes over Western Europe, the spatial patterns of responses and physical processes are distinct in each case (Fig. 13). For example, SST/SIE changes lead to more or less uniform summer mean warming at the surface. In contrast, changes in AAer lead to a band of surface warming and temperature extreme changes in latitude of 40°N–55°N. AAer changes also lead to an increase in summer blocking frequency by 18 % (Figure not shown), which in turn may have an impact on surface warming and increases in temperature extremes. The results in this study illustrate the important role of the direct impact of changes in AAer not only on summer mean temperature but also on temperature extremes. Reduction of AAer precursor emissions not only induces increased downward solar radiation through aerosol-radiation and aerosol-cloud interactions, but also induces local positive feedbacks between surface warming and reduced cloud cover, increased blocking frequency, reduced precipitation, soil moisture, and evaporation (Fig. 13). These changes occur on very short time scales of weeks (e.g., Dong et al. 2015) and are important processes leading to the local increases in DTR, TXx, and frequency of summer days (Fig. 13). The change in cloud, in turn, is closely related to the change in the hydrological cycle. In the next few decades, greenhouse gas concentrations will continue to rise and anthropogenic aerosol precursor emissions over Europe and North America will continue to decline. Our results suggest that the changes in seasonal mean SAT and temperature extremes over Western Europe since the mid-1990s are most likely to be sustained or amplified in the near term, unless other factors intervene. This work was supported by EUCLEIA project funded by the European Union’s Seventh Framework Programme [FP7/2007-2013] under Grant Agreement No. 607085. BD, RTS, and LS are supported by the U.K. National Centre for Atmospheric Science-Climate (NCAS-Climate) at the University of Reading. UD, GPCP, GISTEMP, NCEP/NCAR reanalysis is provided by the NOAA/OAR/ESRL PSD, Boulder, Colorado, USA, from their Web site at http://www.esrl.noaa.gov/psd/. CRUTS3.21 data are available from the British Atmospheric Data Centre from the site http://badc.nerc.ac.uk/browse/badc/cru/data/cru_ts/cru_ts_3.21/data/. HadISST, HadSLP2, and HadCRUT4 data sets are available from http://www.metoffice.gov.uk/hadobs/. E-OBS gridded data set is available from http://www.ecad.eu/download/ensembles/ensembles.php. Authors would like to thank Laura Wilcox for comments and suggestions on the early version of the paper. The authors would also like to thank two anonymous reviewers for their constructive comments and suggestions on the paper.